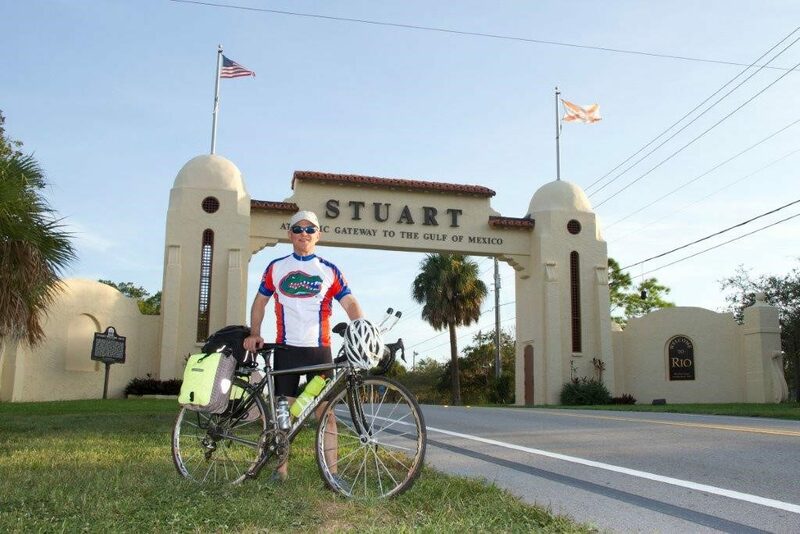 A fourth-generation Martin County resident, Chuck has been cycling the streets of Stuart, Florida since he was a child. He started out like most kids with a single gear bike that he rode with his friends around town until one day in junior high the Taylor University football coach, and his team from Indiana called the “Wandering Wheels” rode through town on their way to Key West, Florida. The bike ride was led by their football Coach Davenport, who originally used the ride from Vero Beach to Key West, Florida as a way to jump-start his football players training each spring. Coach Davenport would become Chuck’s mentor and get him started on a life-long love of cycling. By the time he was 15, Chuck had ridden across the State of Florida three times. In 1973, he rode with a Wheels group that consisting of 40 riders from San Diego, California to Rehoboth Beach, Delaware in twenty-five days. Less than a year after that adventure, Chuck would join up with a different cycling group called the “Spinning Spokes” and cycle through Europe. Coach Davenport was an innovator and safety pioneer that influenced the way Chuck thought about cycling and cycling safety. Coach pioneered the first safety equipment for his riders, engineering neon flags and clothing for rider visibility including having all his rider’s wear hockey helmets to protect them from injuries in the case of an accident or collision. Coach imparted on Chuck how important safety was for a cyclist. This wisdom would lead Chuck to address the county commission for the first cycling lanes in Stuart. In 1982, Chuck’s cycling days took a back seat as he graduated from law school, started his law practice, and began a family with his wife Becky back in Stuart. Nine years ago, Chuck picked up where he left off and began making the annual ride to Key West, Florida with a group of avid cyclists. On October 27th he will celebrate his 10th ride leaving from Florida City and making a 6-day trek to Key West and back. To commemorate the occasion, he has decided to ride in honor of SafeSpace, a charity dedicated to protecting women and children in an abusive relationship. Combining cycling with his law profession was a natural thing for Chuck. Chuck’s law firm of Lesser Lesser Landy & Smith, PLLC represents cyclists all over the state of Florida and Chuck has become known as an advocate for injured cyclists. 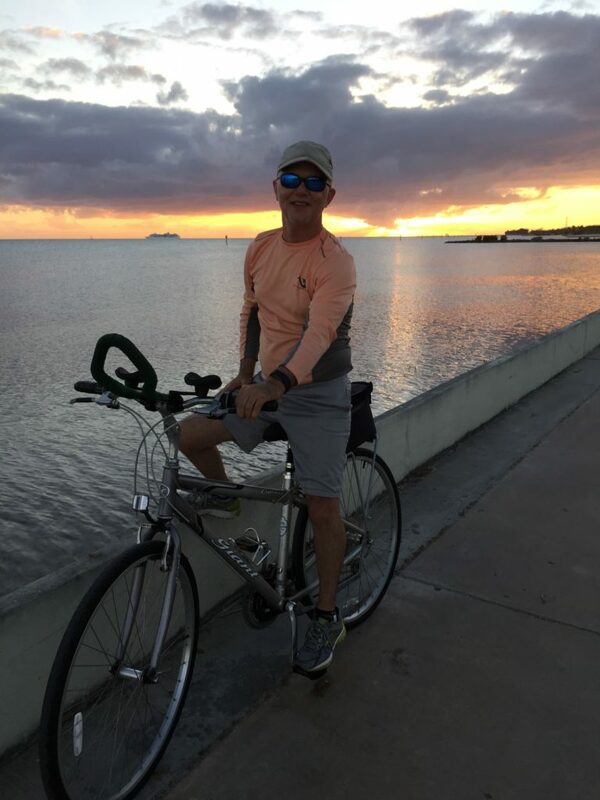 He is also an advocate for bike safety, ensuring riders have safe riding paths on roadways and donating bike helmets and bicycles to local charities so that children in Stuart can find their passion for riding as he did. The Firm will be hosting a Celebrity Bartending Kick-Off Event on Tuesday, October 16th from 5:30pm-7:30pm at Lou Ronzo’s in Stuart. Join us to learn more about Chuck’s 250-mile ride and how SafeSpace is saving women’s lives while enjoying cocktails and free appetizers.